Rasikananda Prabhu preached Krishna consciousness in northern Orissa after the disappearance of Chaitanya Mahaprabhu. He was the principal disciple of Shyamananda Goswami. 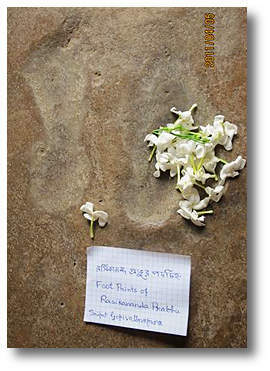 Pictured are the footprints of Rasikananda Pandit, courtesy of the Bhaktivedanta Research Centre.